A Manitoba 2010 greenhouse gas (GHG) emissions report required by the Climate Change and Emissions Reduction Act is now available, announced Manitoba Conservation and Water Stewardship Minister Gord Mackintosh January 31, 2012. The report shows Manitoba's carbon equivalent (C02e) GHG emissions have hovered around 20 mega tonnes (mt) since 2000. Emissions were lowest in 2001 at 19.7 C02e mt and highest in 2008 at 21.6 C02e mt. Overall emissions have declined 2% from 20.7 C02e mt in 2000 to 20.3 C02e mt in 2010. Much of this decline is due to the global economic recession and several plant closures in Manitoba. Emissions were 20.2 C02e mt in 2009, but began to creep back up in 2010. The Climate Change and Emissions Reduction Act had established an emissions reduction target of 6% below 1990 levels by 2012. But acting Conservation Minister Dave Chomiak admitted in December 2011 that Manitoba was unlikely to achieve this target. Manitoba's 2010 emissions are more than 12% above 1990 levels. Although the act was first passed in June 2008, several important provisions of the Climate Change and Emission Reduction Act will not come into force until October 2012. A December 2010 report by Manitoba's Auditor general heavily criticized the Manitoba government for failing to meet or accurately report on the status of its climate change initiatives, carbon inventory, or emissions reductions. The Auditor General specifically said that Manitoba's government needs to move to actual emissions data, and away from estimates and projections. Annual per capita emissions for Manitoba are 16.6 C02e tonnes (t), which is below the per Capita Canadian average of 20.5 C02e t, but higher than Quebec (10.4 C02e t), Ontario (12.6 C02e t), P.E.I (13.4 C02e t), and B.C (14.3 C02e t) according to the latest 2009 National GHG Inventory Report. Environment Canada's National Inventory Report shows Manitoba 2009 greenhouse-gas (GHG) emissions declined 6.3 per cent over 2008 emissions to 20.3 mega-tonnes (Mt). This was just slightly ahead of the national average drop in GHG emissions during 2009. The global recession and reduced use of coal are primarily responsible for the decline. TransCanada Pipeline near Rapid City, Manitoba reduced emissions by 159,162 tonnes. Tembec mill, powered by coal and natural gas, also shut down in 2009. In 2008, the Manitoba government legislated its Kyoto goal - a 6% reduction in emissions below 1990 levels must be met by December 31, 2012. Manitoba's 2009 emissions are still nearly 10% above 1990 levels. Manitoba Conservation Minister Bill Blaikie admitted it will be a challenge for Manitoba to meet its Kyoto target, stating: "We won't get there incrementally. We're likely going to need to make some significant changes. We're going to need some big ideas." GHG emissions data for Manitoba for other high emission sectors is still based on estimates and projections. Auditor General of Manitoba, Carol Bellringer, released her 2010 Report to the Legislative Assembly - Performance Audits including four audits, with an audit of the Manitoba Government performance managing climate change. The audit shows Manitoba needs to update its current climate change plan, Beyond Kyoto, Manitoba's Green Future, Next Steps: 2008, as Manitoba will not meet it's Kyoto emission reduction targets of a 6% reduction in greenhouse gas (GHG) emissions from 1990 as required under the Kyoto Protocol. Even accepting Manitoba's GHG emission reduction projections for 2012 shows Manitoba emission will be 12% higher than in 1990. Manitoba's 2008 emissions were 17% above 1990 levels according to Environment Canada's National Inventory Report released April 2010. This is not the first time Manitoba's has failed to meet it's own GHG emission targets. In its 2002 Climate Change report, Kyoto and Beyond: Meeting and Exceeding Our Kyoto Targets, the government optimistically indicated, "we believe we can achieve reductions of up to 18 per cent below 1990 levels by 2010, and reductions of up to 23 per cent by 2012." The 2002 plan was removed from government websites, and the target downgraded to 6% below 1990 levels when the 2008 climate plan was released. Bellringer highlighted Manitoba's lack of emission targets beyond 2012, and lack of a government-wide tracking system for actual emission reductions, and climate change spending and related economic and social outcomes. (such as the number of jobs created, the non-Provincial funding leveraged, and the number of low-income housing units retro-fitted). In June 2008 Manitoba enacted the Climate Change and Emissions Reduction Act, which enshrined Manitoba's 6% emission reduction by 1990 target into law. The act does not provide any punishment provisions for failure to meet the target, but former Premier Gary Doer suggested: "If we don't achieve it, the ultimate penalty in 2011 will be defeating the government." The Pembina Institute submitted comments on Manitoba's proposed cap-and-trade system as required by the Western Climate Initiative (WCI). Cap-and-trade is a market-based way to cut greenhouse gases that uses economic incentives so that industrial polluters meet emissions reduction targets. Polluters get emission allowances equal to a government cap. If a plant's pollution exceeds the target or cap, it must purchase emission allowances from facilities that have reduced more than their share or else pay fines. The Pembina Institute suggested: Manitoba move quickly to implement a cap-and-trade system by January 2012, set a cap that aligns with short- and medium-term emissions reduction targets, include all source of measurable emissions, and distribute allowances by auction, and eliminate or reduce any reliance on offsets. Canadian Parks and Wilderness Society (CPAWS) Manitoba Chapter submitted comments that echo Pembina Institutes concerns, warning about the short-comings of relying on offsets, and arguing that revenue from a carbon pricing scheme should be used to fund GHG reductions, such as investing in carbon storage through ecosystem protection. The Manitoba Government set up a webpage to collect comments on the proposed Cap and Trade system; however the comments are not being made publicly available on the Government webpage. There is also no public registry for the review. View March 15, 2011 Pembina Institute "Recommendations for Manitoba's proposed cap-and-trade system"
View March 16, 2011 CPAWS Manitoba Chapter "Recommendations for Manitoba's proposed cap-and-trade system"
The Manitoba government has launched a website to gather input on proposed cap-and-trade regulations aimed at reducing harmful emissions from polluting industries. Comments are due by March 15, 2011. Climate Action Network Canada board member Gaile Whelan-Enns noted the consultation were inadequate, "it appears there's no public meetings, no presentations, nor is there a public registry." Cap-and-trade analyst Matt Horne of the Pembina Institute agreed that thorough consultation on the topic is vital, "there's a bunch of nuts and bolt issues that really do matter. The devil is in the details." Cap-and-trade is a market-based approach to cutting greenhouse gases that uses economic incentives to force industrial polluters to meet an overall emissions reduction target. Polluters get emission allowances equal to government pollution cap. If a plant's pollution exceeds the target or cap, it must purchase emission allowances from facilities that have reduced more than their share or pay fines. Manitoba's system would integrate with the Western Climate Initiative (WCI), a regional cap-and-trade program. Current WCI members include B.C., Manitoba, Ontario, Quebec, California and six other western U.S. states. No government press release has been issued. View Manitoba Government webpage "Cap and Trade Consultation"
The Manitoba Government and City of Brandon plan to reduce greenhouse-gas emissions from the Eastview Landfill through a $1.275-million agreement as part of Manitoba's landfill gas capture program. Up to $1.275 million will flow to Brandon to design and construct a facility to capture methane gas generated at the landfill. The Brandon project will eliminate an estimated 57,000 tonnes of greenhouse-gas emissions each year, the equivalent of taking 11,000 cars off the road. "The City of Brandon is pleased to work with the Province of Manitoba on this extremely important environmental initiative," said Dave Burgess, Mayor of Brandon. "This agreement will lead to elimination of thousands of tonnes of greenhouse gas, improving the environment in Brandon and contributing to the overall reduction of greenhouse gas in this province," stated Conservation Minister Bill Blaikie. Manitoba's landfill gas capture program will enable three of the province's largest landfills to make significant reductions to the amount of greenhouse gas emissions they release. In total, this will amount to 195,000 tonnes of reductions per year, or almost one per cent of the total Manitoba emissions. The Government of Manitoba launched GreenRegistry.org October 30, 2008. The Green Registry is a website that provides organizations, companies, families and individuals with information, guidance, and tools to help Manitobans "understand the sources of greenhouse gas (GHG) emissions and how to measure and reduce these emissions". Manitoba's commitment to the Kyoto target of reducing greenhouse gas (GHG) emissions 6% below 1990 levels by 2012 is also clearly indicated. The website provides aggregate 1990 GHG emissions baseline for Manitoba of 18Mt and acknowledges that by 2005 the province's GHG emissions had risen by 12.8% to 20.3Mt. The Green Registry does not provide new or more detailed information about Manitoba's GHG on a sectoral basis (GHG emissions breakdown for the transportation, agriculture, energy, residential, heavy industry sectors or emissions from major development projects or public works projects). The Green Registry website does not include a carbon or GHG inventory for the province. It appears Manitoba's actual 'Green Registry' (still in development) will be used to register, track and showcase verified GHG emissions reductions and removals (VERRs). It appear the Green Registry will not be used as a tool for reporting of GHG emissions generated by Manitobans, Manitoba companies and the Manitoba government. No baseline data, thresholds, or GHG/carbon inventories are provided. Manitoba Wildlands will be watching to see how this registry and future regulation will fulfill the climate change protocols our government has signed onto with US partners. Last year in its analysis and ranking of provincial and territorial climate change plan, the David Suzuki Foundation (DSF) praised Manitoba for having the second-best plan in Canada (released in 2002), second only to Quebec. This year, Manitoba's ranking slipped; its plan is now rated as 'good', along with Ontario's plan, while Quebec's plan is rated as 'very good' and British Columbia tops the list with a rating of 'best'. 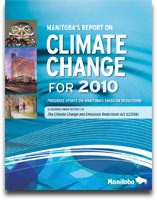 Manitoba released a new climate change plan in April 2008. 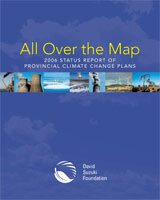 The David Suzuki Foundation (DSF) report, Provincial Power Play: Breaking Away from Federal Inaction on Climate Change, looks at provincial and territorial action on climate change, compares their greenhouse gas emissions, assesses their climate change plans and evaluates their records. 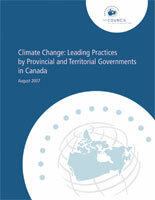 Manitoba Wildlands contributed information and analysis for evaluation of Manitoba's climate change plan. The report was released July 16, 2008 at the Council of the Federation meeting in Quebec City, where provincial and territorial premiers met to discuss what they can do on climate change. strong proposed measures on energy efficiency, including energy-saving targets for Manitoba Hydro, greater efficiency standards for furnaces and boilers, and a new energy code for new commercial buildings (but not residential ones). The report, however, also found that Manitoba could still strengthen and improve its climate change plan and initiatives. The province does not yet have a policy or program in place to protect natural carbon stores in forests and peatlands, is lacking in meaningful policies to address emissions from the transportation sector, and needs to have a formal plan to adapt to climate change impacts. The Manitoba government has ignored its responsibility to report to Manitobans on specific results and actions since the 2002 Climate Change Plan, Kyoto and Beyond. The DSF evaluation of provincial and territorial climate change plans highlights the fact that most provinces have better climate change plans than Canada's federal government, stronger GHG emissions reduction targets, and stronger policies to achieve them. The federal approach to making polluters pay for carbon emissions will take four years to develop and will be a weak and already discredited intensity-based system. So far, only governments that clearly oppose action on climate change have used intensity targets (GHG emission reductions per unit of economic activity, like a barrel of oil produced), and their emissions have continued to rise. As a result, the Suzuki Foundation is calling on the federal government to follow the lead of the provinces and set strong, national standards across Canada (in order to create a level and fair playing field). This is especially important in order to rein in greenhouse gas increases in Alberta. The report warns it will be impossible for Canada to meet international standards if Alberta doesn't do something substantive on global warming. "Nothing calls out for concerted federal government action on climate change more than Alberta's callous indifference to its impacts on the planet," says the report. On June 12, 2008, Manitoba's Climate Change and Emissions Reduction Act (Bill 15) received royal assent in the Manitoba legislature, enshrining Manitoba's commitment to meeting the Kyoto protocol target by 2012 for reduction of greenhouse gas (GHG) emissions and the commitment to set long term emissions reduction targets in law. Certain sections of the Act have not yet been enacted and will come into force later by proclamation. As of August 2010 sections 7, 8, 11, 12, & 21 had still not been proclaimed. These sections provided for: green building requirements for government owned or funded buildings (s. 7 & 8), fuel efficiency standards and alternative fuel requirements for government vehicles (s. 11 & 12), and, subject to certain exemptions, an end to the importation of motor vehicles made in 1995 or before (s. 21). More than two years after passage, only two regulations have been drafted under the Climate Change and Emissions Reduction Act. 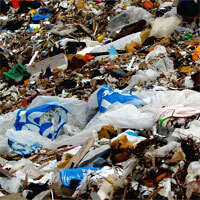 Regualtion 180/2009 defines "prescribed landfills" as being those containing more than 750,000 tonnes of waste. In combination with s. 15 of the Act, this regulation requires the province's three largest landfills to capture or flare excess methane. Regualtion 186/2009 sets out procedures for notification, and defines when Manitoba Hydro may burn coal for the purposes of emergency operations. The legislative process for Bill 15 included an opportunity for the public to speak and/or submit comments as part of a session of the all party Legislative Review Committee of the Manitoba legislature. Gaile Whelan Enns, Director of Manitoba Wildlands, appeared before the committee to support the Bill, and recommend steps to strengthen the Bill. On April 11, 2008, Manitoba introduced new legislation - Bill 15 The Climate Change and Emission Reductions Act - that requires the province to meet Canada's Kyoto target for 2008-2012 and set long-term goals for 2020 and 2025. In order to meet its Kyoto commitments, Manitoba must reduce its annual emissions to 17 megatonnes (MT) from approximately 20 MT. To achieve this, the first goal is to reduce GHGs below 2000 levels by 2010.
reduce emissions through future climate action investments by 250,000-plus tonnes. Some initiatives announced to achieve reduction of GHG emissions include: updating building codes, banning import of cars older than the 1995 model year, and allowing zero emission vehicles onto the province's roads. The government has committed $145 million over four years to implement the law. The Climate Action Network (CAN-RAC), Canada's umbrella organization representing environmental and civil society from across the country who are concerned about global climate change, congratulated Manitoba for taking a leading role in the fight against climate change in Canada. There are questions and concerns because the legislation leaves many questions that will only be answered as regulations are drafted and come into force - which will take some time. Gaile Whelan Enns, Director of Manitoba Wildlands, emphasized the need for Manitobans to support the legislation and get involved in building the substance of the legislation, as it currently provides only a basic framework. "Our government is acting on its commitments to reduce emissions inside Manitoba by meeting the Kyoto target. Cooperative work with large emitters, and collaboration with Manitoban communities and companies, will provide models for other provinces and states." Recommendations for the transportation regulations will not be made until 2009, which means that they may not come into effect until 2010 - a significant time gap that could be avoided if Manitoba simply follows California's lead. Six Midwestern governors and the Premier of Manitoba signed agreements to promote renewable energy and climate stewardship in Milwaukee November 14, 2007. The governors of Iowa, Illinois, Kansas, Michigan, Minnesota, and Wisconsin and the premier of Manitoba signed the "Greenhouse Gas Accord", which commits the states and Manitoba to work together to slash emissions linked to global warming over coming decades. They will establish regional targets for reducing greenhouse gases as well as a regional cap and trade mechanism for carbon emissions. Develop and implement additional steps to achieve reduction targets. All new coal-fired power plants built after 2020 required to capture carbon dioxide, ship to an underground storage site. By 2030 30% of region's electricity comes from renewable energy sources (wind turbines, landfill gas). One-third of region's gas stations selling the E85 blend of ethanol by 2025. Manitoba Premier Gary Doer and British Columbia Premier Gordon Campbell signed a Memorandum of Understanding (MOU) October 23, 2007 that commits the two provinces to work together on a number of initiatives including climate change. Both provinces have also signed on as members of the Western Climate Initiative (see below). Premier Gary Doer also promised to introduce legislation fall 2007 which will set targets for reducing greenhouse gases in Manitoba and lay out penalties for industries which don't comply. Doer has previously committed Manitoba to meeting Kyoto Protocol target of a cut in emissions to six per cent below 1990 levels by 2012, which would mean a cut of 3.5 megatonnes of greenhouse gases. In 2005, Manitoba emitted an estimated 20.30 megatonnes of greenhouse gases, including carbon dioxide, methane and nitrous oxide - an increase of more than 12 per cent since 1990. On October 29, 2007, leaders of more than 15 governments met in Lisbon, Portugal to launch the establishment of the International Carbon Action Partnership (ICAP). ICAP is made up of countries and regions that have implemented or are actively pursuing the implementation of carbon markets through mandatory cap and trade systems. A declaration was signed as part of the international meeting by the coalition of European countries, U.S. states, Canadian provinces, New Zealand and Norway. Manitoba Premier Gary Doer attended the meeting and signed the Declaration. ...provide an international forum in which governments and public authorities adopting mandatory greenhouse gas emissions cap and trade systems will share experiences and best practices on the design of emissions trading schemes. Manitoba Premier Gary Doer joined the rest of Canada's Premiers and territorial leaders for the annual meeting of the Council of the Federation - the name given to itself by the group comprised of Canada's provincial and territorial leaders. The August 8-10, 2007 meetings in Moncton, New Brunswick, began with urging by Canadian environmental groups to overcome "federal inaction" on climate change and take necessary steps to significantly reduce greenhouse gas emissions. Climate Action Network (CAN-RAC) Canada, a nation-wide network comprised of over 60 national and regional environmental groups, sent a letter to provincial and territorial premiers on the eve of the Moncton meetings calling on the provinces and territories to provide leadership in taking necessary action to reduce greenhouse gases. Manitoba Premier Doer and B.C. Premier Gordon Campbell played up the idea of convincing the other provinces to set up a system to cap greenhouse-gas emissions, and allow for trading of credits for those provinces or industries who can't meet the cap. However, little progress was made, with Alberta particularly reticent to agree to a cap on emissions or a national trading system for carbon credits. The August 10th Council of the Federation press release was less than earth shattering. A nation-wide climate change plan with binding emissions reduction targets was absent from the statement, and there is no mention of a carbon credit trading system. Instead, the premiers and territorial leaders agreed to "implement energy conservation strategies" that will only apply "within their own jurisdictions" and "according to each province's plan for climate change." At the close of the Moncton meetings, the Council of the Federation also released the report, Leading Practices by Provincial and Territorial Governments in Canada. 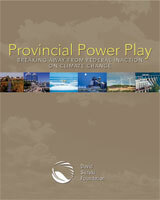 The report is referenced in the press release as containing concrete actions designed to achieve goals agreed to by the leaders, but the report introduction characterizes it as "an overview of activity underway at the provincial and territorial level" as well as recently announced government commitments on climate change. The Government of Manitoba will collaborate with the Canadian Standards Association (CSA) and Canadian Climate Exchange (CCE) in designing market based solutions to reduce greenhouse gas (GHG) emissions in Manitoba and beyond its borders. Market mechanisms are intended to provide a price signal and financial incentive for emissions reductions and the three parties will work together to help proponents develop and showcase GHG emission reducing projects. A primary objective of the partnership is a system for reporting greenhouse gas (GHG) emissions. The conceptual design of a web-based portal that would facilitate public reporting of GHG inventories and emission reducing projects is intended to be the first phase of a Manitoba-based Climate Change Registry. 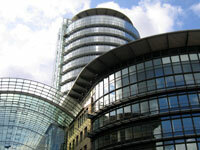 Another objective is to be able to provide verified GHG credits for organizations wishing to reduce their GHG footprint. Manitoba's has a 2007 election goal to be the first Canadian province to legislate provincial GHG emission reduction targets. The Canadian Climate Exchange (CCE) was created in 2003, as a sister company to the Winnipeg Commodity exchange to develop a marketplace for GHG emissions trading. The Canadian Standards Association (CSA) is a membership association serving industry, government, consumers and other interested parties in Canada. It is a leading developer of standards and codes that enhance public safety, improve quality of life, preserve the environment and facilitate trade. Manitoba Wildlands will be watching to see if information to support emissions reductions is fully accessible, and based on carbon inventories, public targets, and previous emissions data. For a success to emerge Manitoba's emissions at home will need to actually reduce - rather than simply be traded away. Caps on emissions are an essential tool in such registry based systems. Premier Gary Doer and California Governor Arnold Schwarzenegger signed an agreement December 14, 2006 committing the two governments to further action on climate change. A central feature of the five-year memorandum of understanding (MOU) is support from California for Manitoba's plan to draft legislation aimed at reducing greenhouse gases. California recently passed legislation that will make it the first US state to limit GHG emissions. continuing to exchange best practices in renewable energy technology (solar power in California and geothermal in Manitoba), residential and commercial building efficiency, waste reduction, and new transportation and agricultural initiatives to reduce greenhouse gases. There have been no updates to the Commercial Building Energy Code since 2006, however the Manitoba Government implemented the "Green Building Policy for Manitoba Government Funded Projects" to encourage green building, and Manitoba Hydro has implemented "PowerSmart Design Standards for New or Renovated Buildings" that must be followed to qualify for the Power Smart designation. Manitoba Energy and Mines Minister Jim Rondeau released a report from the Manitoba Energy Code Advisory Committee October 18, 2006. The September 2006 advisory report, Building Energy, Building Leadership, outlines a strategy intended to make new commercial buildings in Manitoba energy efficient and less expensive to operate. The report demonstrates energy-efficient components such as greater insulation, high-performance windows and efficient T8 and LED lighting that can deliver significant energy savings without significant capital-cost increases. Manitoba used to lead the rest of Canada in fighting global warming. That's changing and the province's efforts are getting weaker, according to the David Suzuki Foundation report released October 12, 2006. The second edition of The Suzuki Foundation's All Over the Map report assessed provincial and territorial action on climate change, compares each region's greenhouse gas emissions, analyzes their climate change plans and evaluates their records. The report praised Manitoba for having the second-best plan in Canada (released in 2002), second only to Quebec, and commended Manitoba's target for large emission reductions, achieved partly by installing ground-source heat pumps. It also pointed to weaknesses such as rising emissions from transportation and agriculture and an over-reliance on big, new hydro projects. 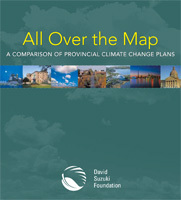 In The Suzuki Foundation's 2005 analysis, Manitoba's climate change plan was praised as the best of all the provincial and territorial plans. However, the report also noted that almost half of Manitoba's emission reductions are premised on hydro power export to US and points out that "Manitoba's greenhouse gas emissions increased 11.5% between 1990 and 2003". The report is also critical of a major weakness of Manitoba's climate change plan: a dependence on other governments to achieve its targets. In December 2005 Premier Gary Doer co chaired The Climate Leaders Summit in Montreal, with Premier Charrest of Quebec. The summit was attended by government leaders of cities, countries and US states, as a parallel event during the Kyoto meetings in Montreal. A leaders declaration was signed at the summit. Also during December 2005, Manitoba and Premier Doer were featured by The Climate Group in their climate change awards. The Manitoba government is a founding member of The Climate Group.